The DeLorean may seem like a throwback to the 1980s, but its sleek style remains modern. And soon, an electric version of the gull-winged sports car will be available. Most design trends from the 1980s look hopelessly dated today: parachute pants, padded shoulders, sponge-painted walls, Patrick Nagel prints, and Laura Ashley fabrics. 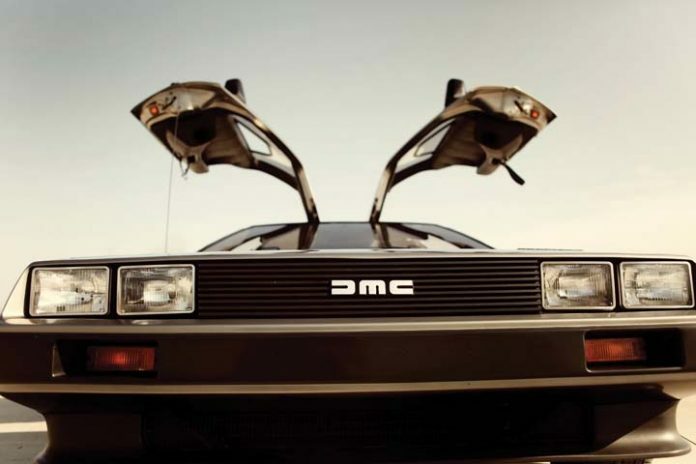 However, one design from the era that retains its freshness is the DMC-12, better known as the DeLorean automobile. The brainchild of design and engineering whiz John DeLorean (famous for creating the Pontiac GTO and reviving that GM division in the 1960s), the car still has a quality that makes it distinctive and modern. With its gull-wing doors (they open up instead of out), brushed stainless-steel body, and liquid-cooled rear engine, the DeLorean has a contemporary sleekness that time hasn’t dimmed. “It’s often been remarked that the DeLorean had a timeless design, and it really has,” says Byron Cancelmo, who owns a 1981 model. “The DeLorean looks as good now as it did back then,” the Waterford resident adds. Of course, the release of the 1985 flick Back to the Future boosted the popularity of the car, which was made into a tricked-out time machine in the film. 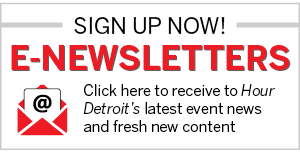 Cancelmo is president of DeLorean Motor City, a club formed in 2005 for DeLorean owners and enthusiasts who attend parades, tours, “cruise-ins,” ’80s nostalgia events, and the Woodward Dream Cruise. Cancelmo says events are sometimes held in conjunction with two other clubs — the DeLorean Club of Ohio and DeLorean Midwest Connection, headquartered in Illinois. Collectively, the three have close to 100 members, he says. There are additional clubs worldwide. Cancelmo’s captivation with the car took root while he was growing up in Massachusetts. Even before he could drive, he was smitten by the auto. “When I was 12, I had my mother take me to the dealership,” he says. “She went home and told my dad about it. Just for fun, they took a DeLorean for a test drive, he fell in love with it, and bought it. A year later, he bought another one.” Back then, a new DeLorean’s price started north of $25,000. In 2004, his father passed that first car on to him, and Cancelmo spent about $15,000 renovating it. When he takes it for a spin, heads also spin. “People are really drawn to it,” he says. “At the Dream Cruise, people were jumping out of their seats to get a look at it. It’s like a UFO. But beyond its snappy appearance, Cancelmo says his car, which has only 13,000 miles on the odometer, is a dream to drive. Even though it has only two seats, the six-cylinder DeLorean is roomy inside, he says. “It also has very low vibration,” Cancelmo says. “My wife has a brand-new Nissan Juke, and my DeLorean is quieter. Byron Cancelmo with his 1981 DeLorean. “It looks as good now as it did back then,” the Waterford resident says. 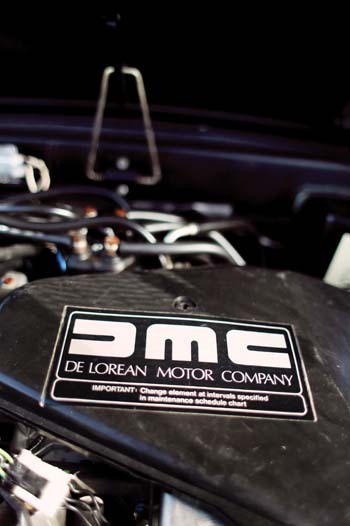 For all of its retro appeal, the DeLorean Motor Co. (DMC) hasn’t really disappeared. 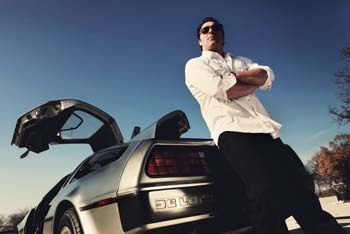 The Humble, Texas-based company (delorean.com) acquired the original firm’s name and logo in 1995 and owns all the remaining stock from the Northern Ireland factory. DMC, which has five American franchises and one in The Netherlands, restores and services original DeLoreans and assembles made-to-order cars. 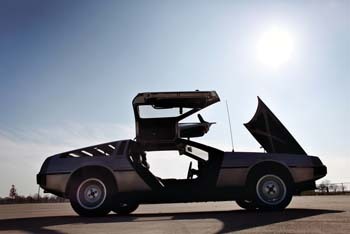 Last fall, DMC, along with American-based Epic Electric Vehicles, announced it will create an electric DeLorean called the DMCEV, for sale in 2013. Like the original DeLorean, the sticker price isn’t cheap — about $90,000. For Cancelmo, an electric DeLorean makes perfect sense. The life of the original company was brief, and only slightly more than 9,000 autos were made. DeLorean’s firm was headed toward bankruptcy and the factory shuttered. He was arrested in 1982 on charges of cocaine trafficking, in a presumed attempt to prop up his foundering company. However, he was acquitted following a trial in which his defense case was based on government entrapment. Yet DeLorean never regained his footing and declared personal bankruptcy in 1999. The man who was brought up in very humble circumstances at Six Mile and Dequindre, put himself through college by attending night school, and rose like a rocket through GM’s ranks, died of a stroke in 2005 at age 80. His ashes are buried at Troy’s White Chapel Cemetery. DeLorean had his share of critics, many of whom saw him as a shady businessman and an insufferable egomaniac. But Cancelmo isn’t one of them. Previous articleWill Electric Cars Overload the Grid?